Ebusus' name (nowadays Ibiza) means 'Island of Bes' (the Egyptian God Bes) SPAIN, Balearic Islands. Ebusus. ca 210-early 2nd Century BC. AE 17mm. 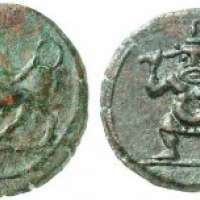 Squatting Kabeiros, holding hammer in right hand, serpent in left / Bull butting left.